Widely recognized as one of the best places to retire in Maine, Piper Shores offers seniors a range of independent living apartments and cottages. One of the most important reasons seniors choose independent retirement living at Piper Shores is the assurance that as they age they can continue their active lifestyle and make their own decisions about how they want to spend their time. As a lifecare retirement community, Piper Shores provides residents with the peace of mind from knowing that lifecare combines all the advantages of independent living plus priority access to Holbrook’s living options as needed. Independent living apartments include studios, one bedroom and two bedroom apartments, as well as two bedroom apartments with a den. Independent living cottages are generous in size, with a range of features including full kitchens, vaulted ceilings, fireplaces, garages, and ample storage space. Independent living residents choose whether to spend a relaxing afternoon in the library or garden, or to play bocce on the oceanfront lawn, make furniture in the woodworking shop, plant flowers and vegetables in the community garden, go fishing, take a bike ride, or play a few hands of bridge. Unlike other retirement communities in Maine, nonprofit Piper Shores’ entrance fee for independent living apartments and cottages is ninety percent (90%) refundable to residents or to their estates. Piper Shores also offers a declining balance entrance fee option that may be ideal for a new resident with less available cash on hand or who is not planning on leaving an estate to heirs. 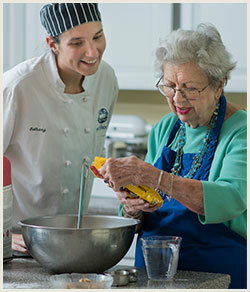 Visit Piper Shores Independent Living to read more.